Prototype: German Railroad, Inc. (DB AG) class 101 express locomotive. Advertising locomotive, road no. 101 016, painted and lettered for "60 Years of UNICEF". Model: The locomotive has an mfx digital decoder, controlled high-efficiency propulsion, and a sound effects generator. 2 axles powered. Traction tires. The trucks have movable reproductions of the mechanical gear for steering them. The headlights / marker lights are maintenance-free LED's. The headlights / marker lights will work in conventional operation and can be controlled digitally. The engineer's cabs have interior details. Length over the buffers 21.9 cm / 8-5/8. An authentic model of road no. 101 016-4.
mfx decoder and high-efficiency propulsion. Contribution to the aid work done by UNICEF. One-time series for the anniversary of 60 Years of UNICEF. 60 Years of UNICEF - Congratulations! When the United Nations established its children's emergency aid organization at its first full assembly on December 11, 1946, it gave the United Nations International Children's Emergency Fund the task of helping starving and sick children in devastated Europe until the greatest need had been overcome. After that UNICEF started large aid programs in the developing countries. Today, UNICEF is one of the most famous children's rights organizations in the world. 7,000 employees in 160 countries are committed to enabling children to go to school, to have medical treatment, nourishment, and clean water, and to be protected from exploitation. UNICEF finances itself entirely from voluntary contributions from governments and from private donations. More than a third of the total income comes from private donations and from the sale of UNICEF greeting cards by 37 national committees in the industrialized countries. The German Committee for UNICEF was founded in Cologne in 1953. Marklin has traditionally been committed equally to the interest of children and teenagers. Our motto Experience Technology is now an increasingly important part of the education and development of young people all over the world. We want to fulfill this great challenge with all of our products and with all of our work. 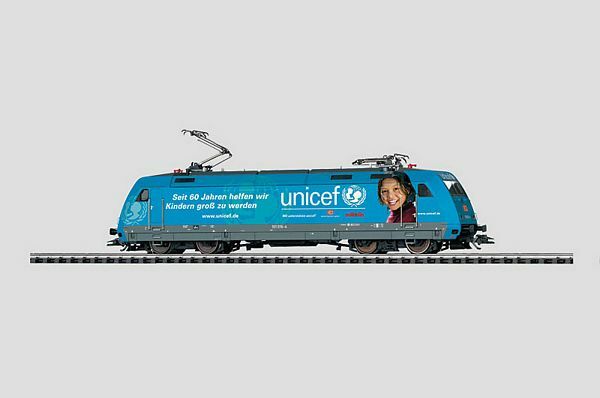 We are happy to participate together with the German Railroad, Inc. in an anniversary promotion for the benefit of UNICEF, in which the centerpiece is a large and a small locomotive. The authentic model of road no. 101 016-4 advertises for UNICEF like its large prototype - at the same time it is contributing to the active support of this children's emergency aid organization. UNICEF will receive a donation from Marklin of € 25.00 from the profits of each locomotive sold in this series. With this unique railroad model you will receive both a high quality, scale reproduction of precision technology and the opportunity to participate in many important projects for the children of our world and thereby for our future. The German Railroad, Inc. and Marklin are supporting UNICEF with a special promotion on the occasion of its 60th birthday. Marklin will donate € 25.00 to UNICEF for each 37399 locomotive sold.